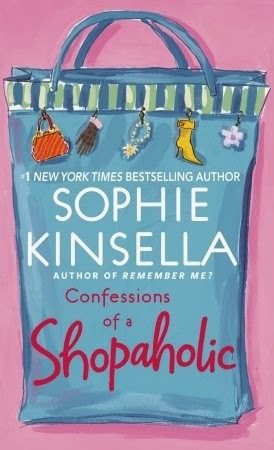 Interesting fact: Sophie Kinsella's Confessions of a Shopaholic was published originally in the U.K. as The Secret Dreamworld of a Shopaholic. I just found that out. Actually, I would have liked that more. Envisioning Becky Bloomwood, the shopaholic in question, as a female Walter Mitty might have endeared her to me. As it was, I really despised this character. Really despised her. I found her shallow and worse than being addicted to brand names, she was a pathological liar. From the cover blurbs, I gather that I was supposed to be charmed and amused by Becky's exploits. But when her lying gets to point where she's telling her parents that a banker who's trying to track her down is a stalker, I'm not only not amused, I'm actually offended. Realizing that I was never going to warm to this woman, I tried to find some sympathy. Here's a person with an honest-to-god psychological disorder (actually two, if you count the lying). There's a scene when she's fallen off the wagon (of trying to actually save some money) and she's at a check out line and she's humiliated to find that all of her credit cards are being rejected. Surely this is a rock bottom moment. For the briefest of seconds, I cared. Unfortunately, Kinsella played it out like just another part of the joke, and there was very little soul searching to follow. The only good thing I can say is that I must have found the character believable to dislike her this much. I liked the first two in the series but hated the rest. I found her soooooooo annoying! Happily for you, John, there is a whole series of Schopaholic books for you to despise! Bridget Jones is so much more sympathetic. I share your dislike for this book. A lot. I had to read this for a literature course in college, and I made my dislike for the book very, very vocal. The book was cringe worthy, more so know there's a series. Sigh, it been well received, so I do like to see there are more readers out there who feel the same way as I do. Teena: Dear heavens, it gets worse? Barbara: No, I think Becky and I will part ways. I'm open to Bridget. Jules: How did your opinions go over in class? I'm shocked! Shocked that you didn't like this book. I would never have predicted this.